I was worried about Men in Black III. Almost every minute of Men and Black II made me wish I’d snuck in a beer or six, and I don’t think I could take more disappointment from Will Smith. I still haven’t fully forgiven him for Hancock. The third installment turned out to be about 1000% better than the second effort, chock full of witty one-liners, truly disgusting alien encounters, and a few good men who look damn fine in black suits and skinny ties. The story begins with Boris the Animal, a vicious alien villain played convincingly by a one-armed Jemaine Clement. He growls his lines, has a dart-shooting minion that lives in his hand, and is still pretty pissed about Agent K shooting his arm off in ’69, and locking him up in prison on the moon. 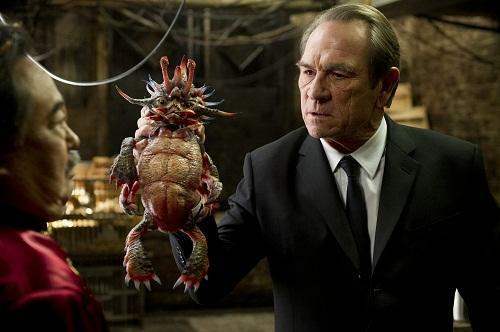 Tommy Lee Jones just can’t stay away from one-armed men. Boris will not rest until he kills Agent K, but how can he kill him before K shoots his arm off? Time travel! Obviously. Agent J (Will Smith, who still looks the same age as he was in the first MIB) doesn’t like life without K in it, so he goes back in time to kill Boris before he can kill K, hoping to save his partner and plant Earth in one fell swoop. In the end, we all learn a lesson about friendship, heroism, and the real reason K is such a crotchety old man. Etan Cohen sure does know how to write a script. This film perfectly balanced action, exposition, depth, and laugh-out-loud zingers. The film’s design was at least as good as the script, with amazing attention to detail in the set, its perfect costuming, and the very impressive makeup work. I love that in 1969, the aliens looked vintage, but the standard Men in Black suit remained exactly the same. I usually don’t find 3-D to be worth the extra money, and this was no exception. There just wasn’t enough for it to make an impact; if anything it was a bit distracting. The film was perfectly cast with each member delivering nuanced and developed performances, which is not always the case in plot-driven action comedies. It would have been easy to phone this one in, relying on the visual effects and comedy to provide enough entertainment, but the believable relationships built among the cast drove the more subtle conflicts. Will Smith was funny, charming, and loyal as his character, Agent J, who is pretty much Will Smith with some fancy guns. But, in this installment he did an especially good job playing a deeper, more mature character. His fight was about friendship more than beating the bad guy. Tommy Lee Jones made the most of his limited screen time with his deadpan delivery and stoicism. He can do more with his face than a lot of guys can do with a whole script. Josh Brolin was a standout, delivering Meryl Streep-level mimicry with his portrayal of the 1969 K. He talked like Tommy Lee Jones, he moved like Tommy Lee Jones, he delivered lines like Tommy Lee Jones… it was uncanny and truly amazing. And who is Michael Stuhlbarg who played the alien, Griffin? (Stuhlbarg can be seen in the film, A Serious Man and the HBO series, Boardwalk Empire. )That was a great character, mostly because it was so well executed. He had me laughing so hard with all of the different ways he saw things happening, but he could turn on a dime to be poignant, empathetic, relieved, or afraid. He certainly held his own against some heavy weights who were in it to win it, building what turned out to be my favorite character. I really enjoyed Men in Black III. It would have been enough for it to be a fun, fast-paced, action comedy, but the fact that it took the time to flesh out the main characters and explore their relationships was really icing on the cake. Great acting, great design, and a great time at the movies. This entry was posted on Friday, May 25th, 2012 at 12:04 am	and is filed under Film, News. You can follow any responses to this entry through the RSS 2.0 feed. You can skip to the end and leave a response. Pinging is currently not allowed. 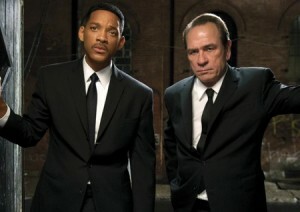 « FedMex Reviews ‘Men In Black 3’!!! What? Your husband is the shooter? That's impossible.